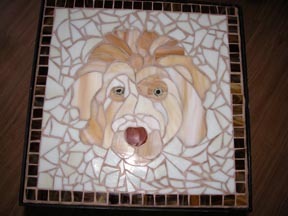 Combining my passions for my dog and my hobby of stained glass resulted in my first mosaic project. I got a new puppy which I love. He is very different for me, much bigger than I am used to. He is an Aussie Doo. That is a cross between an Australian Shepherd and a Poodle. At the same time, I wanted to try mosaics from my hobby of stained glass. I had all this left over glass pieces and I wanted to use them so I decided to combine both my passions, my dog and glass. The result was something I was very satisfied with. For my first mosaic I was very happy how it turned out. I used a board that fit on an old wrought iron table base which I had picked up at a flea market.